The University of Glasgow is one of the olders Universities in Britain, and was founded in 1451. The main Gilbert Scott Building is one of the city's most famous landmarks. 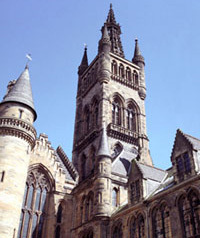 The University of Glasgow has been on its present site in the heart of Glasgow's West End since 1870, when it was moved from the city centre, near Glasgow Cathedral. Glasgow University's Visitor Centre offers a wide range of interactive displays about the University past and present, and there is also a cafetieria and gift shop. The University also features the G12 theatre, the Hunterian Museum and the Hunterian Art Gallery. The Hunterian Art Gallery house the largest collection in the world of works by Glasgow designer and architect Charles Rennie Mackintosh, as well as a reconstruction of the inside of Mackintosh's house, using original fittings and furniture. The University is well placed for visitors; it is within easy walking distance of Charing Cross and the City Centre, and has two underground train stations and many bus services.